Are you lacking wisdom? Are you looking for joy? Are you scared? Are you asking for physical or spiritual healing? Do you need help with a relational crisis? Are you fighting sin and satan? Then come plead your case with us before God. Come join forces with other believers in worship. Are you thankful? Are you grateful? Are you fulfilled and satisfied? Are you victorious? Do you live in abundance? Then come also and give due praise and glory before Him who is worthy. Following praise and worship, we sit down and have a round table bible discussion of selected scripture readings. In 2014; we are studying the Gospel of Matthew. Questions are emailed a few days prior to our meeting to give you time to pray, read, think and meditate. This is followed by a short bible study lecture. 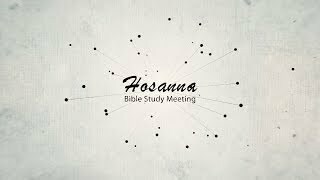 Hosanna focuses on studying God’s Word… it changes lives and restores relationships. Our theme is: “Ask. Seek and Knock. Read God’s Word. Study it & Live it “.